Even after looking up the word, “historicity,” I’m still not sure I know what it means. I suppose that it is like the meat and potatoes of history, the people and places. Real moments like markers solidifying the past. The facts. But sometimes family history lives in our own historicity. Moments of colliding our own memories with a grandmother’s memory. Sometimes we only have the photographs, mixed up with the stories, and the dreams, and our body. And this is what creates the historicity of our family’s lineage. Because the memories are in our blood and our bones, and our likeness to our ancestors. And sometimes facts don’t really make sense. 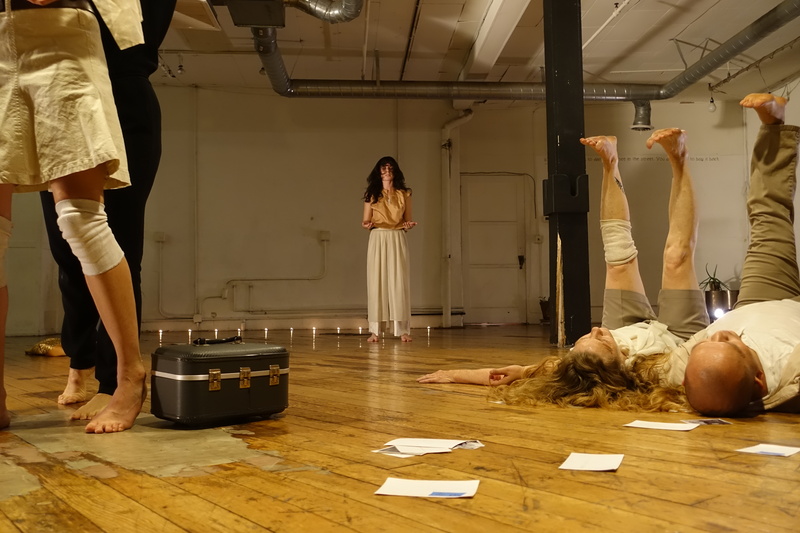 Last evening, I had the delightful pleasure of experiencing Alexx Shilling’s Absence: A History, at Pieter Performance Space. In the familiar coziness of this much-loved studio-space, Alexx as well as the cast and crew brought moments in time to life. As I enter the space I am given a post-card, which reads, “I think my grandma was ready to leave Poland.” And then I am invited to light one of the many tea-candles which line the parameter of a square, a soft easy glow, abruptly reinforced above by a white cord wrapped around square columns. A strange yet inviting ambience, I’m not passing up this opportunity to time travel. These words are later repeated by Nguyen during the piece, “Alexx’s grandmother was ready to leave Poland.” Or wait, does he say, “I think my grandma was ready to leave Poland?” I’m not sure. He repeats these words with growing urgency. The words become muddled for me. Whose grandmother is he talking about? Whose memories is he inhabiting? Peach and cream spacesuits. A chair. A hand-held suitcase passed from body to body. “They were only allowed to carry 7 to 9 pounds.” Snippets of sentences, words repeated. Gestures repeated. Memories traversing non-linear pathways. The same memory inhabited by a different interpreter. It is the same memory, but this time the place is taken by Carol, or Nguyen, or Sarah, or Dorothy. Each interpreter’s uniqueness brings the three-dimensional photographs to life with his or her own historicity. His or her own bones, and blood, and ancestral make-up. Alexx’s voice cries out, “go,” a seemingly arbitrary impulse as though a children’s game, and yet her light sweet voice cuts into the moments when I really start to feel something. A cold cruel interruption, marked and mocked by the innocence of her voice. A way to match the interruption of upheaval, persecution, and subjugation as is an important element of her family’s story. How to fill in the places where we aren’t sure? Maybe we create a new story, one that can still give loyalty to the past. And we let this story get filled in with new bodies, and music that has the genius to generate a nostalgia for the old country, while resonating in a lofty industrial space on the east side of LA, railroad traffic noises in the background. I would like to say “bravo” and “thank you” to Alexx and her cast of interpreters and to the musicians and to everyone who created the quality of this moment, so that we could all be a part of this story, so that we could all be present in something.